This is a guest post from Chris Goodchild. Chris lives in Cranbrook, UK where he is husband to Candy and Dad to four boys. He’s a writer and problem solver and believes that every marriage can be even better. 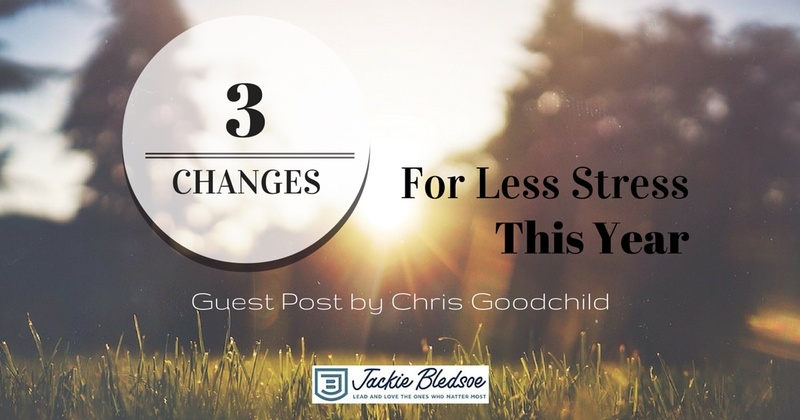 Today he shares three easy-to-implement changes to achieve less stress in life. You can read more of Chris’ writings at ChrisGoodchild.co.uk and connect on Twitter at @WorkingMarried. If you want to guest post on my blog, check out my guest post guidelines and submit your post. I slumped helpless, hopeless into my seat. “Oh God…” I whispered; it was as much as I could say. My head buried in my hands hid the tears that forced themselves through clenched eyelids. What had I done? They didn’t deserve to be treated like that – no one does. Work had been getting on top of me for months. The pressure was building. Once I had enjoyed it. The variety, the challenge, and the people. But now… it was different. Every day I woke with that nauseous feeling in the pit of my stomach. The tension in my chest – at times I felt like it would crush me. Problems at work played on my mind. I couldn’t sleep at night. I started each day exhausted. I don’t know when it started; it came on slowly. If it had been sudden I’d have noticed. I’d have done something about it before now. And so tonight, I had sent the boys scurrying to their beds having berated them for the most minor of offenses. Little children, excited to see Daddy home from work at last, had been castigated for little more than their enthusiasm. I was supposed to be the one they looked up to, for security and leadership. Yet there I was, unable to even control my temper at the slightest annoyance. I wasn’t doing a very good job at loving my wife, or our children. I was the breadwinner, but that seemed to be the only value I brought to our family. I felt alone, a failure. I wept…. Why is it that we men tend to resist help, particularly those of us who are introverts? We work like crazy to provide for our family. At the end of the day we collapse, sleep, then wake to do it all over again. We drift into isolation, into the danger zone. We are unable to build and maintain the relationships with those closest to us, much less those further afield. Our pride says, “I should be able to fix this.” It’s not until we finally hit rock-bottom that we concede and admit our limits. When I hit rock-bottom Candy, my wife, persuaded me to go and see the doctor. I came away from that appointment shocked; I was told I must not work for a month. This was more serious than I realized. Now, a year down the line, much has changed; many lessons have been learned. There is a saying that insanity is doing the same things over and over but expecting different results. Fundamentally this reminds us the power to change is not only within our grasp, but it starts with us. We have to make a decision. We must want change. Though I was not able to eradicate the stress in my life, I was able to reduce it. Although I didn’t enjoy my job, I came to a point where I no longer saw quitting as my only way of escape. I made a choice to change my attitude. Instead of only seeing my job as a source of problems, I decided to be grateful. Instead of feeling trapped by the impossibilities of others’ demands, I actively prioritized my work each day and adopted an I-can-only-do-what-I-can-do attitude. There was no point in beating myself up over things I didn’t have the capacity for. Working your body helps your mind. My job was sedentary; I spent many hours sitting at my desk, in meetings or in the car. Whilst off work I took over walking the boys the mile to school and back each day. I made use of the exercise DVDs that had been gathering dust on our shelves. Often I would spend too long, too late, on social media. I defined a bedtime. I practically eliminated my computer usage. My Facebook and Twitter presence may have been almost nil, but my most valuable friendships didn’t suffer. I am an introvert. I’m not a great talker. I think things through before I speak. Meeting with my pastor and close friends, I was forced to think aloud. My thinking could be quizzed and wrong assumptions or conclusions challenged. Often we can’t see the solution to our own problems. We are designed to live in community. We need others to light our way, to help us carry our burdens. Have you ever reached your limits? Are you there now? However dark the night, there is hope; the light will come. Question: What changes do you need to make this year? You can leave a comment by clicking here.